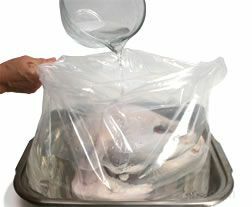 Brining turkey is an easy process that is done by soaking a turkey in a salt and water solution. Brining a turkey makes for a moist and flavorful meat. "Our turkey this year is only 14 lbs. so I thought this would be a good time to try this brining process. I have always wondered how the meat would turn out." "This process seems like a lot of work. I wonder if it really makes a difference. Maybe I will try it sometime when I am making a smaller turkey. I would be interested in what it does to the turkey." 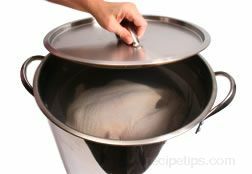 "This article is one of the more efficient articles on the Turkey Brine process. 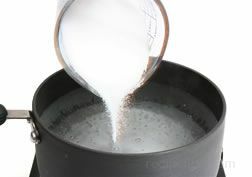 I have searched the web high and low and I find that the brine methods mentioned here is very information, visual and well written. I started using the brine method 2 years ago and I must say that I will never go back to the old way. When I brine my turkey's now with whatever recipe I decide to use they are always juicy, tender and bursting with flavor. 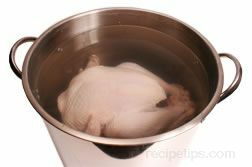 Thanks kcamon www.turkey-brine-recipes.com"